Austin, Texas (May 20, 2015) – CodeLathe, a leader in on-premise Enterprise File Sharing and Sync (EFSS) solutions, today announced the latest major release of the IT industry’s most advanced file sharing and sync solution, FileCloud 9.0. FileCloud provides a powerful solution for businesses to organize, manage and share files inside and outside their organization. FileCloud includes apps for desktop computers, laptops, and handheld devices across all mobile operating systems. Public and private sector organizations, and academic institutions use FileCloud to back up, save, and share files in a secure environment. “FileCloud allows Managed IT service providers to offer Enterprise File Share and Sync as a service and opens up an additional revenue stream. The customer managed, site specific encryption keys is a killer feature for service providers and we are very excited to see that in File Cloud 9.0” Said, Eric Hanig, CEO of ExtendASP, a leading control panel provider for hosters and telcos. FileCloud’s important differentiators include its ability to self-host on-premise or on the cloud, and its unique data security implementation that monitors, prevents, and fixes data leakage, a critical component for clients in financial, government and health sectors. Support for file encryption at rest using industry standard AES encryption. File encryption supports a system managed key or an admin provided passphrase (at server startup) for the ultimate in security and for the most demanding of environments. Multi-Tenant sites can each have their separate security keys allowing service providers to offer a compelling solution to businesses without compromising privacy. Two-factor authentication, which is a two-step verification process where the user is required to know not only their password and username, but also an extra security code that is made available exclusively to them. File and folder locking support, a feature that allows someone who is using a file or folder to notify others that it is in use, and that it cannot be modified or downloaded at that time. Industry’s first network share sync where customers have the ability to sync network folders in real-time with client PCs. Granular site management options for IT service providers to set maximum storage usable per site and maximum user accounts per site. Pricing for FileCloud 9.0 starts at USD 999 for 20 licenses per year. Additional user licenses cost USD 25 per user per year. 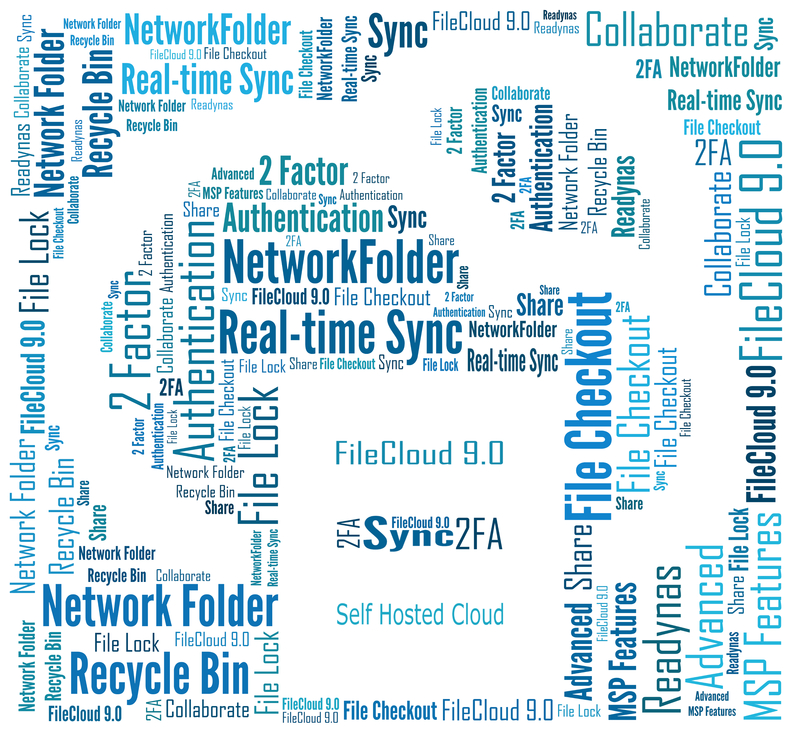 FileCloud 9.0 is available for immediate download at www.getfilecloud.com. For more information or to download FileCloud, please visit www.getfilecloud.com or call 1-888-571-6480.